What is the book about??? 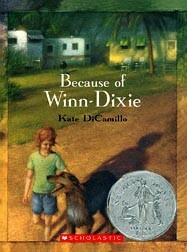 Because of Winn Dixie tells the story of ten-year old Opal. She has just moved to Naomi, Florida with her father who is a preacher. On an errand to the grocery store Opal finds a large, ugly, homeless dog. Opal names the dog Winn Dixie after the grocery store where she finds him. Together they make friends with Otis, an ex-convict who runs the local pet store; Miss Fanny, the librarian who has a desk full of "Litmus Lozenges" a type of candy which her great grandfather invented; and Gloria Dump.